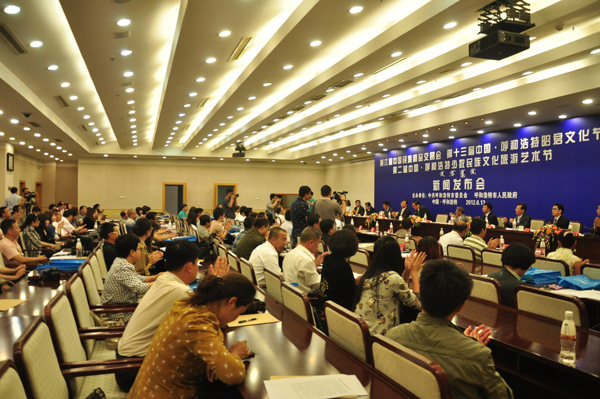 The press conference for the 4th Hohhot International Auto Exhibition (Hohhot Auto Show) and the 6th China National Commodity Trade Fair was held in Hohhot people's government office building of Inner Mongolia on June 13. Leaders such as Hohhot mayor Qin Yi, deputy secretary Zhao Jiangtao, and CNAICO vice president Jing Yongjian attended the press conference. The 4th 2012 Hohhot International Auto Exhibition will be held in the Inner Mongolian international conversion & exhibition center from July 13 to 17. This exhibition will be held together with the 6th China National Commodity Trade Fair, which are co-hosted by the CNAICO and Hohhot Government, and co-undertaken by the Hohhot conversion & exhibition industry management office, Hohhot conversion & exhibition industry service center, CNAICO, China Ocean Aviation Group Inc. China Ocean Aviation Group Inc., China Automotive Sungoal (Beijing) Exhibition Co.,Ltd,and Inner Mongolia Creative Culture Communication Co., Ltd. The support units of the Hohhot Auto Show are the Inner Mongolia autonomous region government and the China National Machinery Industry Corporation. The auto show is expected to have a total exhibition area of 60,000 square meters. In addition to indoor exhibition halls, temporary pavilions are set up in the south and north squares. Nearly 60 national and international vehicle manufacturers will attend the exhibition. There will be hundreds of exhibition vehicle models and nearly 500 exhibition vehicles. It is said that the operation level of this exhibition has been promoted and that sponsors and undertakers have made great improvement on exhibition marketization and humanization. To help visitors buy tickets, the organizing committee will set up three ticket booths in the south, north, and east of the exhibition hall. At the same time, the booking hotline will be available recently for visitors to book tickets in advance. For the convenience of car buyers, the organizing committee will unite financial institutions such as insurance agencies and banks, to provide consumers with the car insurance and automobile consumption loan activities, providing one-stop services. During the auto show, the organizing committee will also hold multiple car culture activities such as photography competition, car model performance, trial driving, and field performance. At the same time, Land Rover, Chevrolet, Subaru, Volvo and other exhibitors will perform rich and colorful activities at the scene. At present, the preparations for the auto show are going well.